Milne Bay is a large bay measuring over 35 km long x 15 km wide located in south-eastern Papua New Guinea in Milne Bay Province. The bay itself, is a sheltered deep water harbour surrounded by the Stirling Range to the north and south. During WWII, the Battle of Milne Bay (25 August – 7 September 1942) took place here. Milne Bay was an important base for the Allied troops, made up predominantly of an Australian garrison. The battle was significant in that it is considered to be the first battle in the Pacific campaign where the Allied forces decisively defeated the strong Japanese land forces, causing them to completely withdraw and abandon their strategic objective. Subsequently, Milne Bay was developed into a major Allied base used to launch further attacks in the region. 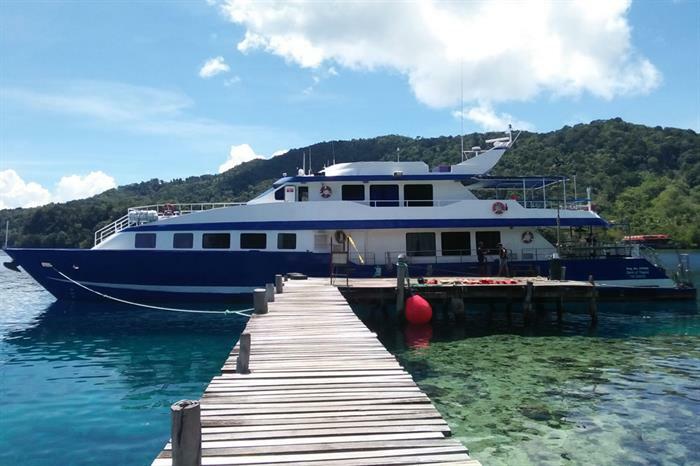 Today, divers come to explore the biologically diverse coral reef systems of Milne Bay and experience the fascinating culture of some of the islands, basing themselves at the secluded yet luxurious Tawali Leisure and Dive Resort or on a dive liveaboard. Alotau is the capital of, and gateway to, Milne Bay Province. It is just a short 50 minute flight from Port Moresby to Gurney Airport. The flat coastal area of Milne Bay is interjected by many river tributaries and mangrove swamps and is prone to malaria and flooding. The densely wooded Stirling Ranges rises to 1,520 metres. If you have extra time, a visit to the outlying islands provides a fascinating experience. Fergusson Island is the largest island in the group, reaching 2,073 metres. It has an active thermal region with hot springs, bubbling mud pools, spouting geysers and volcanoes. There are also some amazing walking tracks. Normanby Island houses the district headquarters at Esa'ala, whish is situated at the entrance to the spectacular Dobu Passage. There are many reefs close to town for excellent snorkelling. Goodenough Island is a spectacularly rugged island, rising 2,566 metres above a flat coastal plain. The peaks of Goodenough Island can be climbed from Lokulokuya Village in two days, however permission must be gained and it is advised to take a guide. Snorkelling in this area is also spectacular. The biggest island of Kiriwina has numerous freshwater holes and burial caves. The best beach for swimming is at Wawela, which also has a lagoon and reef for snorkelling. The Tobriands is one of the best locations to experience the charms of the friendly, peace loving Milne Bay people. Their unique social system is dominated by hereditary chieftains who continue to wield tremendous power and influence, although inheritances and lines of power are passed through the female side of the family. From June - August the Milamala yam harvest festival is held. During festival time, traditional rites are observed. It was from Malinowski's anthropological studies of the customs and sexual practices during this time that The Trobriands became known as “The Islands of Love”. Woodlark is populated by people of Melanesian ancestry known for their attractive wood carvings. Samarai Island was the provincial government headquarters until 1968. Samarai and its nearby islands have good beaches and reefs and some have walking trails. East Cape can be visited in a day. Snorkelling and diving are fantastic here and the beaches and scenery enroute to the cape are beautiful. Walking / trekking The Weddau area on the north coast offers a stunning selection of walks, including a three to four day hike from Weddau to Alotau. For great views you can hike to the top of Mount Pasipasi (600m), behind Dogura. The Cape Vogel area also has bush trails and waterfalls to explore. Bird watching The Alotau area is well known for abundant bird life. November through to January has the optimum and most consistent weather in Milne Bay Province. The rainy season falls between May and August, and has more unpredictable weather with spontaneous, heavy rainstorms. Water temperature drops to a minimum of 25ºC during the rainy season and reaches a maximum of 29ºC during November through January. Most divers find a 5mm or 3mm wetsuit comfortable depending on the time of year and the water temperature they are used too. Visibility on the muck diving sites can drop in the rainy season, so if critters and macro photography are your passion, it is better to schedule for the drier more consistent months at the end and beginning of the year. Visibility on reef sites is usually good for most of the year. Currents on the muck diving sites are generally mild, but overall currents change due to weather and time of day. Milne Bay and offers a variety of dive sites such as muck diving, walls covered in soft corals and large sea fans, anemones with clown fish and variety of large pelagics including hammerheads and whale sharks. A large coral mount coming from up from 140' to just 8' from the surface. Divers are able to dive around the full circumference of the reef with a single tank. The South East side of the reef is littered with soft corals of all descriptions. Large schools of fish feed off this face. This reef also plays host to giant clams and turtles. A strong current often feeds the front face which is why this reef supports so much life. As stated the currents here are mild to very strong. Safety sausage may be required. Travel only 3 minutes away on 22' punts. Wahoo Point is perhaps one of the best chances of catching a glimpse of the larger pelages. Over the years Humpback Whales, Orcas, Tiger Sharks and more frequently encounters with Whale Sharks, Mantas and Hammer Heads have been experienced. On this dive you can expect just about anything to appear in from the blue. Currents are mild to moderate with generally calm seas. This site is located in front of a 400 — 500 meter long pebble beach. Large variety of Critters can be found at this sight from the maximum recommended depths to as shallow as 1 meter (3') - Octopus, Cuttlefish, Lion fish, variety of Ghost Pipe fish, Mimic Octopus, Frog fish, Coleman shrimps, and a variety of Nudibranch. The current here is very mild-to-mild. Barracuda Point is located approximately 8 minutes away from the resort. This reef has a shelf which drops to a depth of approximately 100' at the point. The shelf plays host to a varietyof schooling fish and can be frequented by pelages such as Mantas, Hammerheads and Whale Sharks. On the shelf critters such as rhinopias and Hairy Ghost Pipefish may be. Currents here are mild to moderate in generally calm seas.